Estimates and quotations are the life blood of the field service company. Many of us create hundreds if not thousands every year to win business. With so much competition a great quote is more important than ever. And that is why Flobot has a built in quoting and estimating system. There is no need to get a 3rd party piece of software for this, Flobot makes it simple to create a professional estimate. And what's more its fast. Using the customizable templates in Flobot you can bang out an estimate to your potential client in no time. Even better you can email it and they can accept it straight away by clicking the 'I accept the quote' button. Super fast and fast quotes win more business. Ferguson Flooring are based in Dumbarton, just outside Glasgow. They supply and fit quality flooring across Scotland. They have an excellent reputation for quality and service. Flobot has a quoting module that really is second to none. The ability to build templates for common quotes - as many as you like, to upload your entire price list in one go - and add prices to it as you go, decide what to show the client and what to hide and give yourself a granular breakdown of the costs and profit as you are building it. Well is there anything like that in a bundled package? No. There simply isn't. And now we have a new 'dynamic template' module. Basically build a template in the system or the app, link the ratios of those line items, so for example materials, labour etc and change one value to see all the others change instantly. That's why we call it dynamic! But what it means is that you can send a complex quote out to your customer in one click. And you might even do that while you are still with them! Now you can negotiate face to face. This feature has seen one client increase their closing ratio by 12%. 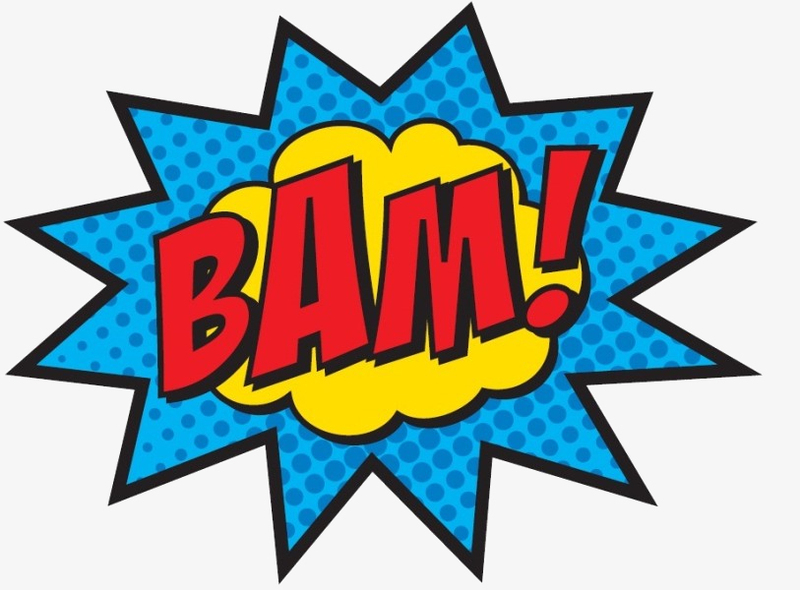 And for that client that equated to an astonishing £24,000 of extra revenue per month- with this feature alone. That really is pretty neat. Easy to use quoting tools built in. You've made the appointment, met the customer, assessed the work and now they need a quote or estimate. Flobot enables you to quickly and easily turn an opportunity into a job with intuitive and easy to use tools allowing you to set your costs and mark-ups. Quotes are issued in customizable slick and professional looking templates via PDF, making your quote stand out out from your competitors. It's great to be able to get your potential customers a quote out quickly, but all too often that's the last you ever hear of them because it can be hard to identify who to chase and when. Flobot allows you to manage your quotations and estimates, see how long they've been outstanding and even whether they have been read by your customers. You can track your conversion ratios, profit margins and forecast all from a simple to use interface. Building quotes and estimates is a breeze! 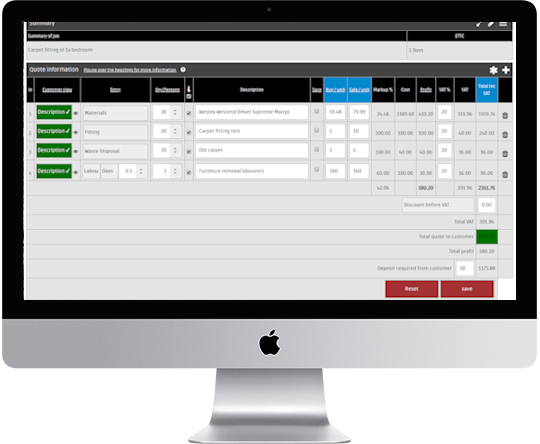 Flobot lets you build quotes quickly and easily, by setting your cost price, adding a mark-up and changing quantities of materials or labour. Flobot instantly updates your quote and even works out the tax and profit for you. You can create your own quotation templates to speed up the process even further. One click and your quote is instantly e-mailed to your potential client. 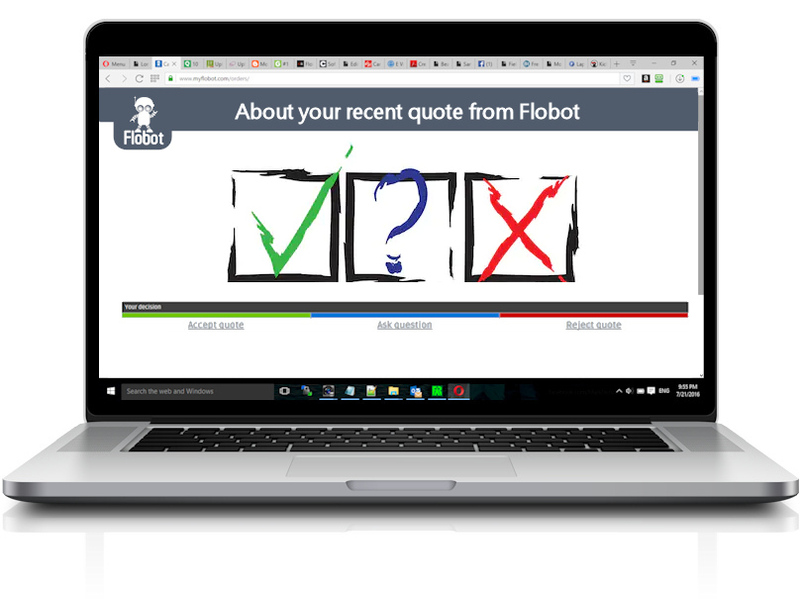 Thanks to Flobot's clever quoting system every quote that you issue contains a prominent decision making tool for your customer, allowing them to quickly and easily inform you of their decision, whether it's an 'Accept' or a 'Reject'. Selecting 'Accept' prompts your customer to pay a deposit if required using a credit or debit card, and selecting 'Reject' allows you to place that all important call to try and save your quote. You can select an option for all of your quotes to be built by your office based team, or allow your field team to build their quote and send it over to the office to add mark-ups, sales material and more. Now you can choose to share the parts of the quotes you're best at - estimating prices and times, or experimenting with pricing and sales - it's so flexible.